The spirituality of India comes alive in the mountains of West Virginia. Hare Krishna temple in the hills of West Virginia, the New Vrindaban community has been an active spiritual retreat since 1968. Vrindaban is also famous for its "Palace of Gold"
Witness temple, devotion in an area surrounded by nature, ponds, organic farming with cow protection in a comfortable stay in one of the guest houses or cottages. Book your stay. 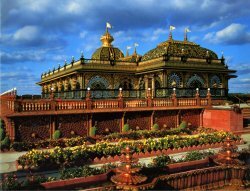 New Vrindaban is an unincorporated area and an ISKCON (Hare Krishna) intentional community located in Marshall County, West Virginia near Moundsville. 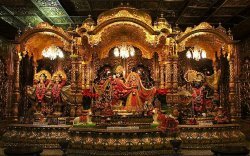 The town consists of 1,204 acres (4.87 km2) (of which 0.1 km² is of water), and several building complexes, homes, apartment buildings, and businesses including the Sri Sri Radha Vrindaban Chandra Temple (RVC Temple) and Prabhupada’s Palace of Gold. New Vrindaban was founded in 1968 under the direct guidance of A.C. Bhaktivedanta Swami Prabhupada, founder of ISKCON. It is named for the Indian city of Vrindavan.